Each morning, over the past several days, I noticed the remains of sunflower seeds near the container of seeds we use for the birds, which we leave on the little table at night. 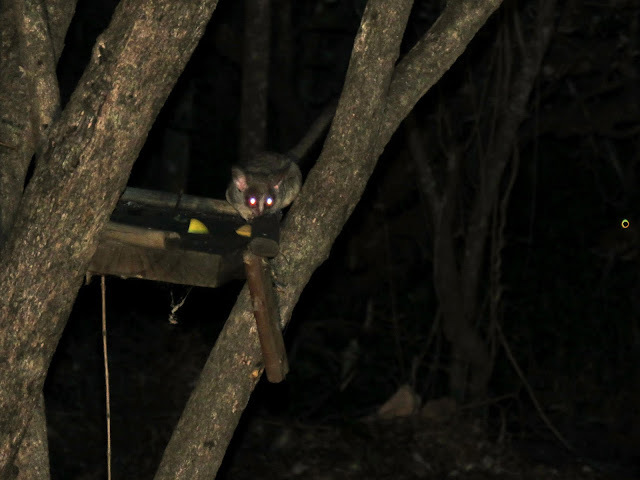 This morning, using Ken's night vision, motion detecting camera, we determined the nighttime intruder is a bushbaby, nocturnal little creatures, who is apparently living inside the house. We have no idea where it sleeps during the day. 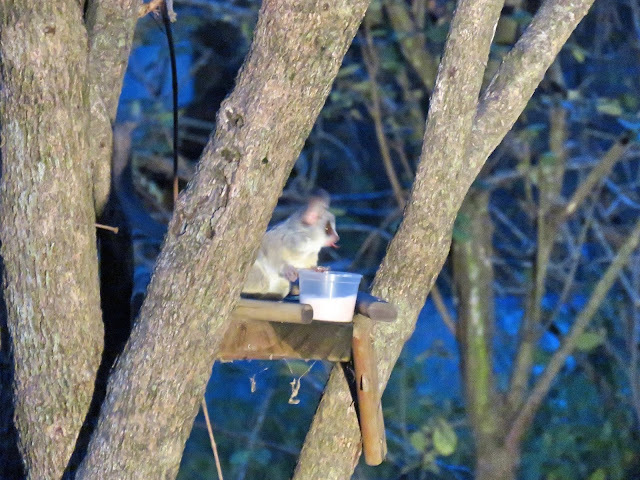 Over the last several nights we noticed someone had gotten into the plastic container of seeds we use for feeding Frank, The Mrs. and other birds that visit us in the garden. Over this past year, during the night, we left the same container on the small table in the dining area of the house, never giving it a thought. During this extended period of living in this house, we'd never observed that any creatures had partaken of its contents. 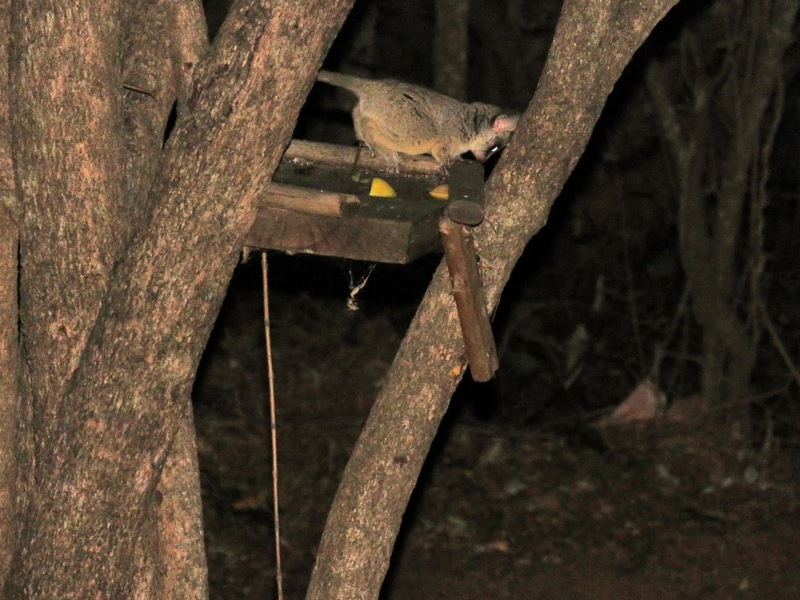 Bushbaby looking for food at the old stand which has since fallen to the ground from kudus pushing at it, looking for food. We showed the remnants of the sunflower seeds scattered on the table to Linda and Ken and we all surmised as to what it could possibly be. I asked Ken if he could set up his night vision, motion detector camera so perhaps overnight last night, we could determine what it might be. Yesterday morning the four of us headed to Lionspruit for the bush braai at Frikkies Dam, hosted by Louise and Danie. This was our fourth such event during the past year and once again, we made our usual egg, sausage, onion and mushroom cheesy casserole to share. 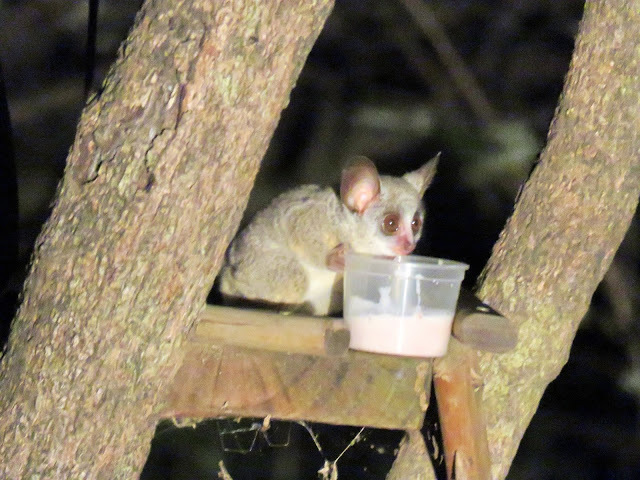 During our first few months, we used the old bushbaby stand for the cups of yogurt. As mentioned in yesterday late post, uploaded after the event late in the afternoon, others had made some excellent food, including Louise and Danie's seafood potjie which I failed to describe as follows: "Get your friends and family together and cook a delicious meal in a South African cast-iron potjie (pronounced 'potchee')! It is an exciting and enjoyable way of relaxing together and a tasty alternative to a barbeque. The potjie is placed over hot coals, either on an open fire or on top of a grill." I was in cookie heaven when Rita brought homemade low carb, gluten free, sugar-free peanut butter cookies. I don't usually make low carb cookies since I have a tendency to eat too many of them. 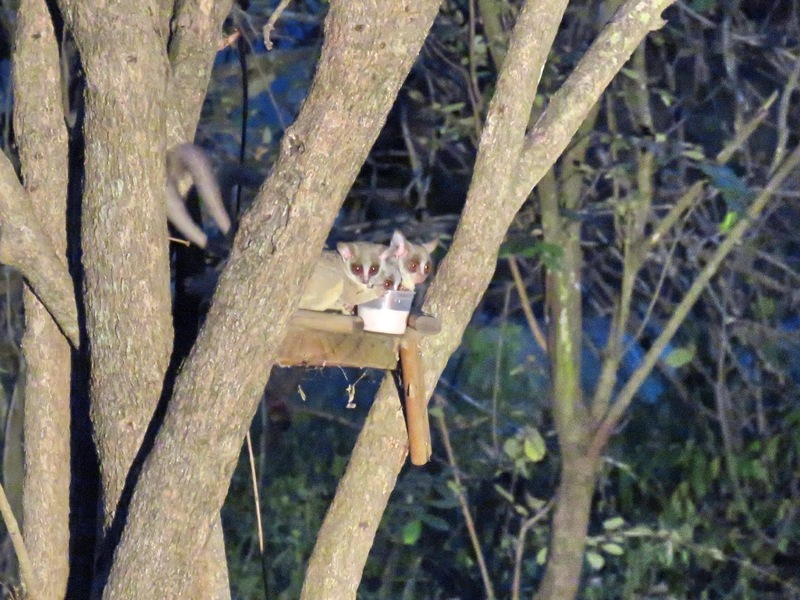 Every night they stopped by for the yogurt. Even good-for-you-foods may be consumed in excess and may not be healthful in doing so after all. Such is the case for me and cookies. At the party, I may have eaten five cookies, and when Rita gave me the balance of the batch to take "home" surely last night, I ate another three or four. Bad, bad, bad when today I felt bloated and uncomfortable. I hate the expression, "everything in moderation." Moderation is just not possible when it comes to certain foods that send us to the moon! Today, I'm back on track and will allow myself one cookie a day until they are gone in five days. It's always adorable to see their little "hands" holding onto the cup. When the four of us returned to the house around 1600 hours (4:00 pm), we contemplated if we'd have room for the delicious low carb Italian casserole I'd prepared early on Sunday morning, hoping we'd eat it for dinner on Sunday evening. If no one ate a morsel until then, we agreed we'd all be ready for dinner by about 1930 hours, (7:30 pm). Linda helped me put the final touches on the meal and make the coleslaw salad. By 1935 (7:35 pm) we were ready to eat again. I stayed away from the cookies during this period. Occasionally, they drop the little cup. On each occasion, Tom picks it up and places it back on the stand. The meal was as good as I'd hoped (if I say so myself). Shortly after dinner and cleanup, we played the domino-type game once again. By 2230 (10:30 pm) we were off to bed with bellies full and anxious for a good night's sleep which ultimately was achieved. But, before we retired for the night, Ken set up the camera to ensure in the morning we'd discover who was the mysterious nighttime intruder getting into the container of bird seeds. 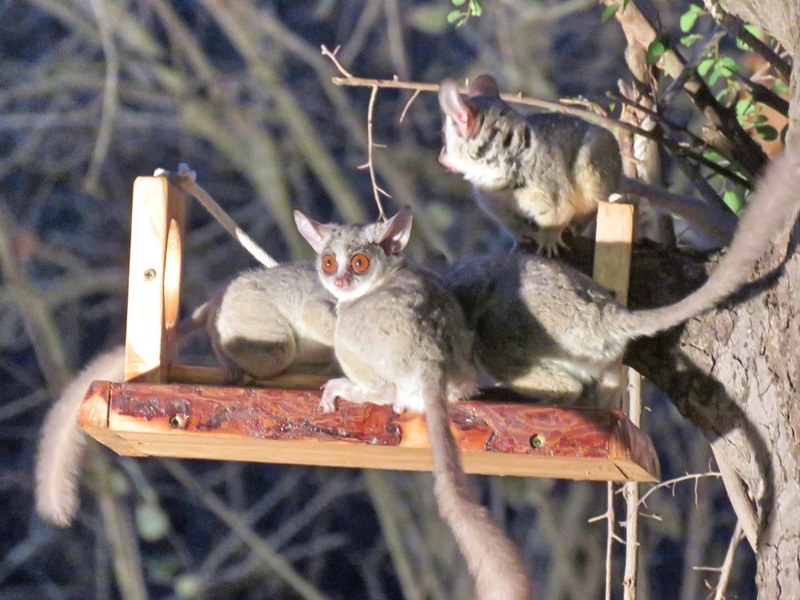 On many occasions, we've seen several bushbabies on the stand. This morning the moment I saw Ken in the kitchen preparing his breakfast, I couldn't resist inquiring as to what he discovered on the camera. He told me to guess. My first guess was a mouse, the obvious choice, Secondly, I suggested a bushbaby and he nodded his head with a big smile on his face. Indeed, the culprit was a bushbaby as shown in today's "Sighting of the Day in the Bush," a furry bulgy-eyed bushbaby which apparently is living somewhere in this house. What a fun discovery! 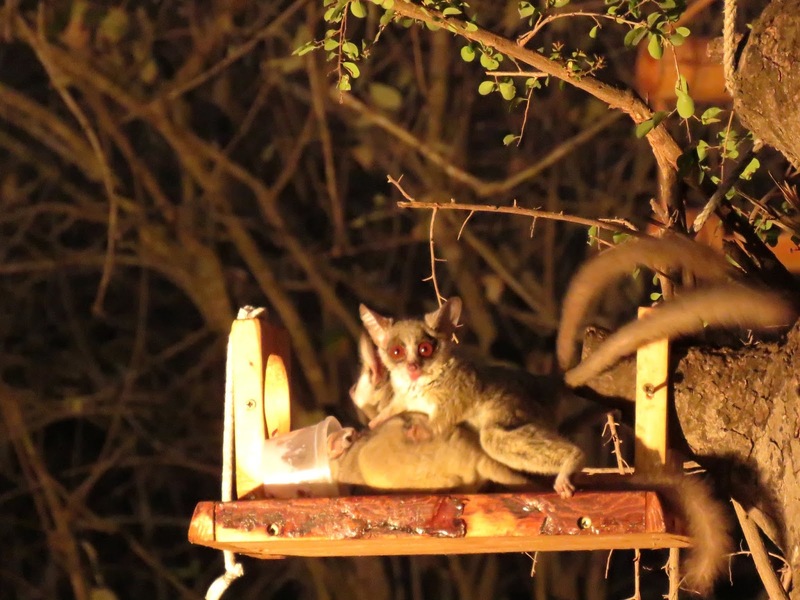 The bushbaby on the bottom has her/his head inside the cup while the others wait, tongue sticking out. Cuteness, overload. Linda and Ken left this morning, but we'll see them again in early February, on the night of our going away party at Kathy and Don's bush home located overlooking the Crocodile River. And Linda is joining Kathy and I for her treat for me of a pedicure at the spa at a local resort. What fun that will be! 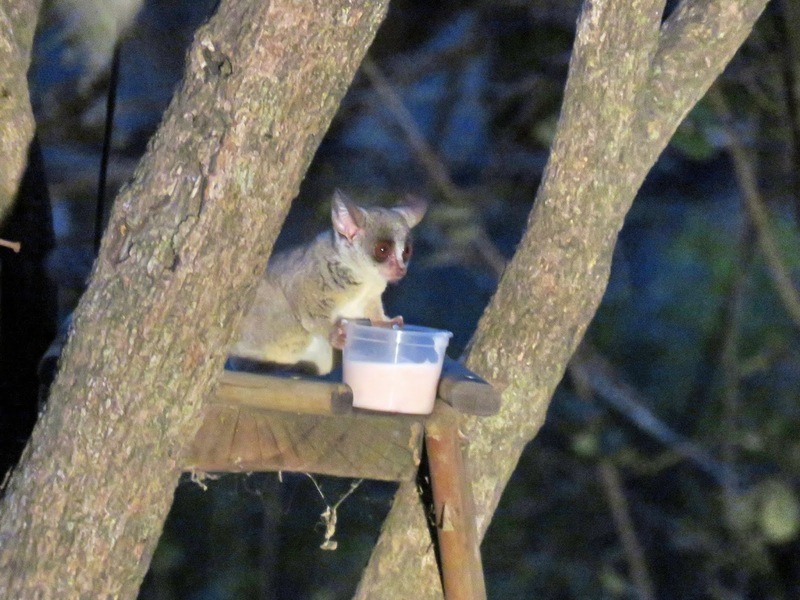 With the bushbaby dilemma solved, with Linda and Ken having left for a camp in Kruger for a few days, Tom and I will settle back into our usual routine. However, the fun is hardly over with Rita and Gerhard and possibly Louise and Danie (depending on their work schedule) joining us for dinner tonight for one more dinner party. Later on, we added this stand which we placed closer to the veranda for better viewing and photos. This is the bush. Between the people and the wildlife, the good times continue on. 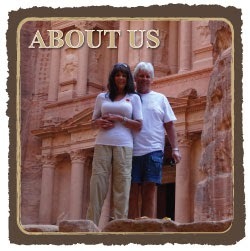 As I write here now, we received an invitation from friends Lynne and Mick for dinner at Jabula on Saturday night. Perfect! We'll be there! The big "E" on this door in Buenos Aires, represents "entrada" in Spanish which translates to "entrance" in English. For more photos, please click here.